US President Donald Trump spoke in Warsaw on Thursday. He called on Russia to stop "destabilising" Ukraine, but he also took a tour through Polish history. So how did that come across, in Poland and elsewhere? And what messages lay behind the historical moments Mr Trump chose to highlight? Here are four lessons from Polish history, as told by the US president in Poland. This came through in the opening remarks: Mr Trump spoke of his "true admiration" for "this magnificent, beautiful piece of land". He name checked famous sons of Poland from the past: "You are the proud nation of Copernicus - think of that - Chopin, Saint John Paul II. "Poland is a land of great heroes." This can be read as the political equivalent of complimenting the host on the decor; it fits nicely with thanking them for the invite, and it makes them feel good before you start. In 1939, Poland was invaded by the Nazis from the west and the Soviets from the east, starting years of division and brutal occupation. "That's trouble", Mr Trump said of that period in history. "That's tough." His words were perhaps too flippant for many watching, and some tweeted about finding it awkward. But he clearly was not just speaking to Poland. He knew his words were being broadcast around the world and would be again in future; that explains sentences like "in August of 1944, Jerusalem Avenue was one of the main roads running east and west through this city just as it is today". The place of his speech was also full of symbolism. He addressed the crowd on Krasinski Square, in front of the monument to the 1944 Warsaw uprising against the Nazi occupation, in which up to 200,000 people died. It is impossible to talk about how the Poland of today was shaped without mentioning this period. In highlighting Poland's "will to survive", he appealed to national pride, to the current governing party, and - important from a president who often tweets about his own enemies - to a sense of surviving against adversity. He did not hesitate to relate the struggles of previous Polish generations to his own country today, indirectly comparing bureaucracy to communism. He said: "On both sides of the Atlantic, our citizens are confronted by yet another danger, one firmly within our control. "This danger is invisible to some but familiar to the Poles: the steady creep of government bureaucracy that drains the vitality and wealth of the people. "The West became great not because of paperwork and regulations but because people were allowed to chase their dreams and pursue their destinies." Mr Trump reminded the watching Poles and the world of a 1979 Mass, when Pope John Paul II returned to his home country despite it being under communism (which forbade religion). 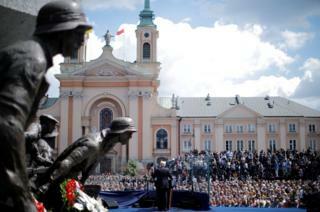 He said that by reaching out to religion, the Polish people "found new courage to face down their oppressors". He said: "A million Polish people did not ask for wealth. They did not ask for privilege. Instead, one million Poles sang three simple words: 'We Want God.'" Mr Trump's message was that Western Christianity would triumph over fundamentalist Islamism. He hammered this home at the end of his speech, after speaking at length about the fight against so-called Islamic State: "Our people will thrive and our civilisation will triumph. "So together, let us all fight like the Poles - for family, for freedom, for country, and for God." "America loves Poland, and America loves the Polish people," Mr Trump said. He also congratulated Casimir Pulaski and Tadeusz Kosciuszko, who are military heroes in both countries. But his words were not only about the past. He thanked the country for buying Patriot missile defence systems from the US, in a multibillion dollar contract. And he reassured Poland over Nato's Article Five, the alliance's commitment to mutual defence in the event of an attack on a member, amid anxieties in the region over Russia's intentions. "As long as we know our history, we will know how to build our future," the president said. His words in Warsaw offered pointers as to what he hoped that future might be.